Determine if a Sudoku is valid. 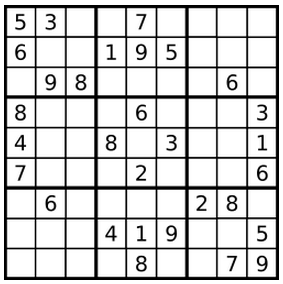 The Sudoku board could be partially filled, where empty cells are filled with the character '.'. 1 2 3 . . . . . .
4 5 6 . . . . . .
What if we check the sum of all the digits in each row,column & squares. Assumption here is that board is filled all int 0 to 9. 0 means blank. May be someone can help me with a better hash function for squares? Using a HashSet for convenience.